Operators at WX4NHC, the Amateur Radio station at the National Hurricane Center in Miami, activated their HF and EchoLink/IRLP operations on Tuesday, August 7, 2012 at 6 PM EDT, for hurricane Ernesto. The station continued operations until the storm made landfall on the southern coast of the Yucatán Peninsula late that evening. The Category 1 hurricane brought heavy rains and winds, but weakened as it moved across land. Due to this weakening, the National Hurricane Center (NHC) downgraded Ernesto to a tropical storm at 5 AM EDT Wednesday morning. WX4NHC operators requested land based stations as well as ships at sea in the areas affected to send them weather data and damage reports. Stations were asked to check in to the Hurricane Watch Net, EchoLink/IRLP channels, and the VoIP Hurricane Net to convey reports. WX4NHC operators also monitored CWOP, APRS and MADIS/MESONET automated weather stations in the affected areas. WX4NHC Assistant Coordinator Julio Ripoll, WD4R, thanked outreach partner Fidelio Cobos, XE3AFC, for sending several detailed reports during Hurricane Ernesto's onslaught. Fidelio was active on the Mexican Net on 40 meters and brought back reports via EchoLink with several submitted directly to the NHC via its on-line reporting form. WX4NHC monitored the Mexican 40 meter net on 7.060 MHz until landfall and it was very active, reported Ripoll. Ripoll said that "this is one example of the benefits gained by being proactive with our outreach to hams in areas that are affected by hurricanes." "Our approach of notifying amateurs and clubs throughout parts of ITU Region 2 that are affected by hurricanes in advance of hurricane season hopefully brings more active stations to participate in the HWN, VoIP Nets and other modes or means they can use to send data to WX4NHC." Ripoll concluded, "I have witnessed so many times while sitting for hours in front of a radio at NHC listening to mostly static, we get that one report that makes a big difference, whether it is a piece of data that fills in the gap for the hurricane forecasters or a ship in trouble trying to race to port before it's too late." Ripoll thanked all operators for their support during Hurricane Ernesto. For more information on the Amateur Radio station WX4NHC at the National Hurricane Center in Miami, click here. Randall Landers, KG4EUD, Mikey Phillips, KI4KOT, and Tracy Stephens, KI4OZG, with the Calhoun County ARES/RACES in Anniston, Alabama participated in a recent Red Cross Shelter Exercise conducted by the Calhoun/Cleburne County Chapter of the American Red Cross. The exercise centered on the process of setting up a shelter in the event of a disaster. The scenario in this exercise was a tornado that struck part of the county and a shelter set up at the Greenbrier Road Baptist Church. operators to support and maintain disaster response and emergency communications for a disaster at a Red Cross shelter was discussed. During this exercise, we set up our communications station with the call sign WX4CAL. We employed two ICOM ID-880 radios along with several handhelds to operate on our local VHF ARES/RACES repeater and also used D-STAR digital simplex. We also used a laptop computer with DVAP that provided D-STAR digital communications that would have been used for statewide or worldwide operations if needed. In addition to the Amateur Radio equipment, we used the GRLevel3 weather radar program, which would have been a valuable tool for use if this had been an actual event. During the course of the day the participants were rotated to and from each station to learn more about each shelter function. 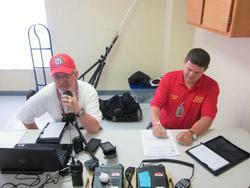 At our communication area, both Landers and Stephens explained to the Red Cross volunteers about Amateur Radio operations in the event of a true disaster, and more specifically, at a Red Cross shelter. Karen Howle-Hurst, American Red Cross Mid-Alabama Region District Emergency Services Specialist, was on hand to watch the exercise and was pleased to have the Calhoun County ARES/RACES as a part of the shelter exercise. A bonus was that there was one Red Cross Intern and one Red Cross volunteer who wanted to know more about how to get licensed. Landers was also pleased at how smoothly the exercise went. The station was set up quickly and all radio operators were ready to perform their duties as Red Cross Shelter communications volunteers. He also indicated that if there had been a need for our ARES/RACES Emergency Communication Trailer there would have been plenty of room to park it next to the building close to the room where the radios had been set up. Saying that it believes that the Amateur Service "allows flexibility to provide emergency communications in a way that takes into account channel availability and other local conditions," the FCC denied a Petition for Rulemaking to create a nationwide emergency calling frequency. The Petition -- filed by Bryan Boyle, WB0YLE, of Morrisville, Pennsylvania, and Jim Dixon, WB6NIL, of Alhambra, California -- called upon the FCC to designate 146.550 MHz as a "non-exclusive nationwide Amateur Radio Service emergency communications channel using FM wideband modulation." Doyle and Dixon noted in their Petition that other services, such as the Citizens Band Radio Service, the Aviation Service and the Maritime Service have specific channels set aside for emergency communications. They claimed that use of these channels "to good effect by those in distress [and that this] is a testament to the need for individual services to have a readily accessible and publicized" emergency communications channel. In denying the Petition, the FCC said in part that Boyle and Dixon "had not shown an existing problem that would be addressed by a rule change designating a nationwide Amateur Service emergency calling frequency." According to the National Oceanic and Atmospheric Administration (NOAA), the 2012 Atlantic hurricane season has been "busy," with six named storms since the season began June 1. In May 2012, NOAA forecasters originally indicated a 50 percent chance for a near-normal season in 2012, and predicted the chances for an above-normal season at 25 percent and a below-normal season at 25 percent. But on August 9, NOAA revised the chances for an above-normal season -- upping the odds to 35 percent -- while saying that the chances for a below-normal season have decreased to 15 percent. Across the entire Atlantic Basin for the season -- June 1 to November 30 -- NOAA's updated seasonal outlook projects a total (including the 2012 tropical storms Alberto, Beryl, Debbie, Florence and the 2012 hurricanes Chris and Ernesto) of 12 to 17 named storms (top winds of 39 miles per hour or higher), including 5 to 8 hurricanes (top winds of 74 miles per hour or higher) of which 2 to 3 could be major hurricanes (Category 3, 4 or 5 with winds of at least 111 miles per hour). The numbers are higher from the initial outlook in May, which called for 9-15 named storms, 4-8 hurricanes and 1-3 major hurricanes. Based on a 30 year average, a normal Atlantic hurricane season produces 12 named storms, six hurricanes, and three major hurricanes. "We are increasing the likelihood of an above-normal season because storm-conducive wind patterns and warmer-than-normal sea surface temperatures are now in place in the Atlantic," said NOAA Climate Prediction Center Lead Seasonal Hurricane Forecaster Dr Gerry Bell. "These conditions are linked to the ongoing high activity era for Atlantic hurricanes that began in 1995. Also, strong early-season activity is generally indicative of a more active season." But NOAA seasonal climate forecasters also announced on August 9 that El Niño will likely develop in August or September. "El Niño is a competing factor, because it strengthens the vertical wind shear over the Atlantic, which suppresses storm development," Bell explained. "But we don't expect El Niño's influence until later in the season." * National Community/Neighborhood Exercise Series Continues -- The series of Formidable Footprint exercises for neighborhood, community and faith based organizations continues on August 25 with a hurricane exercise and on September 29 for a solar storm exercise. A flood scenario is planned for October 27. Exercises have also been scheduled for the following scenarios: Earthquake; Influenza Pandemic; Tornado; and Wildfire. The Formidable Footprint exercise series has been developed in accordance with Homeland Security Exercise and Evaluation Program (HSEEP) protocols. The objective of the exercise series is for CERTs, Neighborhood Watch Programs, Neighborhood Associations, Community/Faith Based Organizations, Citizen Corps, Fire Corps and others to work as a team to become better prepared for the next disaster their community may face. There is NO CHARGE for participation in any of the Formidable Footprint exercises. For additional information or to register for upcoming exercises, click here. I wanted to comment on your insightful article in July 2012 QST on ARES and mental health risks. It brought back some uncomfortable memories of Hurricane Andrew response. When I was the RACES coordinator in Dade County for that event, I sent more than 150 amateurs into the field. Among the bad memories was the ham who was sent to Homestead and was killed by lightning while helping unload a helicopter. He is one of the names on the memorial plaque at ARRL HQ in Newington containing the names and call signs of hams to die in service. Although no one blamed me for having deployed him there, it weighed heavily on my mind for a number of years. Similarly, I witnessed a number of emergency responders - both hams and non-hams - crack under the pressure of response, some in highly responsible government positions. Among the results and after-action analyses of Andrew, we established that hams would be eligible for county-administered CISD - Critical Incident Stress Debriefing - a form of psychotherapy for individuals suffering from PTSD - Post Traumatic Stress Disorder. It was recognized that hams in stressful communication situations can suffer the same PTSD as public safety professionals and other emergency responders. On July 17th the ARRL hosted the 2012 Hurricane Webinar with presentations by VOIP WX Net, the Hurricane Watch Net, WX4NHC, and ARRL HQ Emergency Preparedness Manager Mike Corey, KI1U. While the webinar was generally well attended and the presentation covered a lot of valuable material, the webinar was fraught with problems. The feedback that was received has been reviewed and we are making plans to apply corrections to next year's hurricane webinar. Our sincere apologies for the problems with this one, it did not live up to the high expectations of the presenters or the attendees. That being said, the webinar was recorded and has been placed on the website available for download. You can access the webinar video here. Thank you again to all who attended and stuck it out through the issues and problems. It is time to consider the drafting and development of an ARES QSO Party. I think the demand for such an operating event would be very high, given the rise in interest in public service, disaster response, emergency communications and indeed the ARES program itself since 9/11. An ARES QSO Party would promote on-the-air practice of skills of message handling and efficiency, and would go a long way towards networking of local, district and Section ARES groups across the country. To create this operating event would require ARRL Board of Directors' approval, but we in the ARES community can start the ball rolling by drafting a specific proposal for ultimate Board consideration. Ideas?